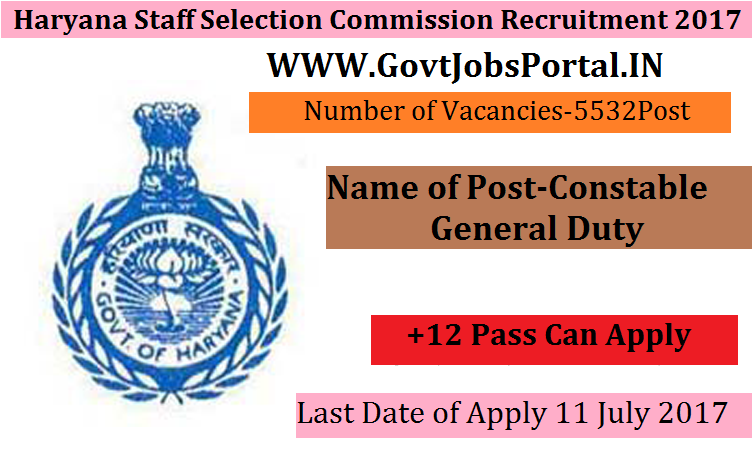 Haryana Staff Selection Commission is going to recruit fresher candidates in India for Constable General Duty Posts. So, those candidates who are willing to work with this organization they May apply for this post. Last Date of Apply 11-July-2017. Total numbers of vacancies are 5532 Posts. Only those candidates are eligible who have passed 10+2 or its equivalent from a recognized education board/institution for all the categories. Indian citizen having age in between 18 to 30 years can apply for this Haryana Staff Selection Commission Recruitment 2017. Educational Criteria: Only those candidates are eligible who have passed 10+2 or its equivalent from a recognized education board/institution for all the categories. Age Criteria: Candidates age limit should to be possess minimum age 18 years & maximum age 30 year. What is the Process for Selection this HPSC job?